Every year, I eagerly anticipate the first blooms of plants new to my garden. The anticipation is particularly keen when the plants are perennials that I’ve managed to start from seed, plant out, and successfully overwinter. Will the blooms be worth the effort expended, and the long wait? Will hummingbirds appreciate the new offerings? Ipomopsis aggregata, native to mountains in the western U.S. Though this season is still young, I’ve already been through this anticipation with two new plants in my garden. 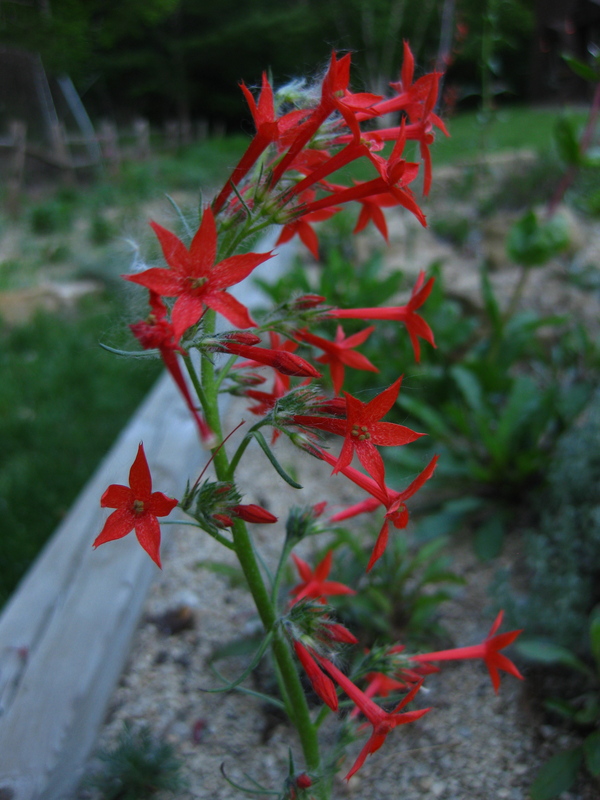 The first of the two to bloom in the garden was Ipomopsis aggregata, a plant native to the mountains of the western United States. It is of particular interest to me because I spent two memorable summers at the Rocky Mountain Biological Laboratory north of Crested Butte, Colorado studying the pollination biology and evolution of this species with the field crew of Dr. Diane Campbell, a professor in the department of Ecology and Evolutionary Biology at the University of California, Irvine. I obtained seed of this species from seed exchanges a number of times, but had difficulty (ok, no success at all!) trying to germinate it by wintersowing. Frustrated with my failed attempts, I took my remaining seed out to my sand bed a couple of autumns ago and sowed it directly in the bed. Lo and behold, a few seeds germinated and last summer I had three rosettes of their finely directed leaves develop. The largest of the rosettes is the only one that has bloomed this year; I’m not sure if the other two will bloom this year or wait one more year. For those of you familiar with the related Texas native standing cypress (Ipomopsis rubra), this is a much shorter plant (my blooming plant is a bit over a foot tall). Standing cypress is much easier to grow here, and is much more widely available, but it is nice to meet the challenge of growing a difficult species, especially one that you have connected with in it’s native setting. 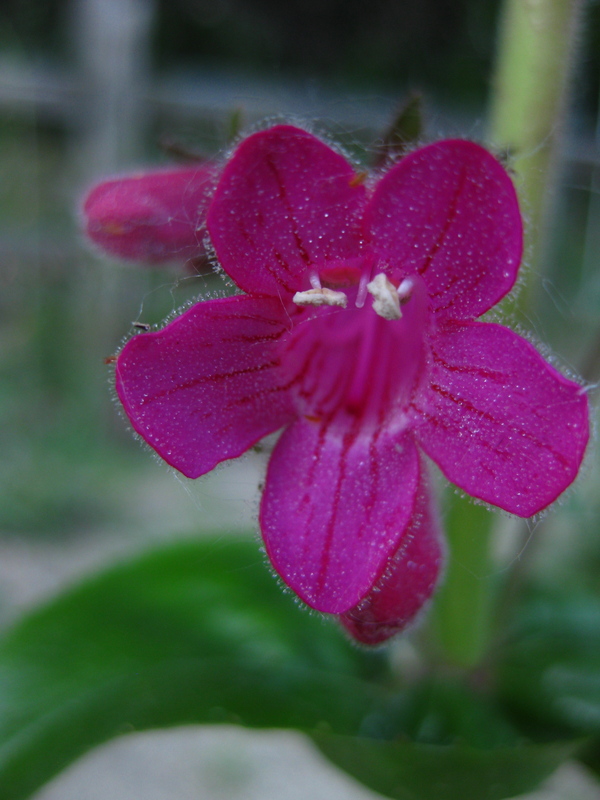 The second much anticipated bloom was of Penstemon triflorus. This is a beautiful penstemon, native to Texas. The leaves are a deep, shiny green, unlike all the other penstemon I’ve grown. I obtained seed of this from a number of seed exchanges, and finally had some luck germinating it last year. I planted them out last summer in my raised, limestone sand-amended bed. Because I didn’t want to take any chances with it not surviving the winter, I covered the plants last fall with bags of leaves and a tarp last November. The plants sailed through the winter, and wasted no time this spring sending up flowering stalks. They are in full, glorious bloom right now, with beautiful magenta flowers atop two foot tall flowering spikes.